Montreal serves as a cultural hub in southwestern Quebec and is also one of Canada's largest cities. Because of its position on the Hochelaga Archipelago, the city experiences long, frigid winters, trademarked by intense cold and heavy snow. Despite this, the city can be an excellent (and romantic) place to celebrate the season, provided you stay sufficiently warm! Montreal is particularly beautiful in December as the city lights up for the Christmas holidays. Enjoy light shows, window displays, ice skating, and great shopping. Montreal's humid-continental climate means that the city experiences cold winter and warm summers. Temperatures during this month average just 22 degrees Fahrenheit (-5 degrees Celsius). Additionally, the temperature in December never exceeds freezing for 19 days out of the month. While January and February in Montreal are the snowiest months, December sees its fair share of powder too. 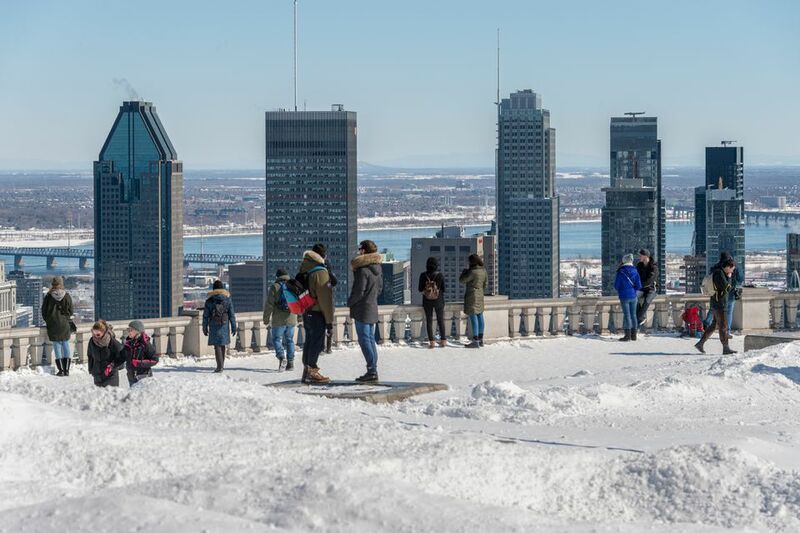 Montreal usually receives around 23 inches of snow, with a layer of 10 inches of snow on the ground by the month's end. Blizzards, which can bring large amounts of snow, aren't uncommon; an 1887 blizzard dumped 16 inches on the city. Visitors can expect rain about eight days out of the month during December. Montreal has cold, snowy winters. The sub-zero temperatures feel colder because of the wind chill factor. But, temperatures are not necessarily unpleasant if you're prepared. Visitors to Montreal in December should be ready for a variety of temperatures. Warm spells have been known to happen, so pack clothing that can be layered. If you are not accustomed to a northern climate, don't be unprepared for the extreme cold, ice, and snow you may encounter in Montreal in December. A short jacket, jeans, and sneakers just won't cut it. Proper winter wear is a must—and layers are key. In addition to keeping you warm, layers allow flexibility depending on the climate you're in; this is useful if you'll be indoors and outdoors throughout the day. Montreal's cold weather is countered by an event-packed holiday season. Joyeux Décembre! : Mont-Royal Avenue is alive with holiday festivities, including light displays and music. Christmas at the Garden: In December and January, this festive event joins music and horticulture together to create an enchanting holiday setting. And Then There Was Light: This permanent exhibit includes a historical and cultural multimedia show at the Notre-Dame de Montréal Basilica. Saint Joseph’s Oratory: The local favorite always has special events planned throughout December. Image+nation: Montreal's LGBT film festival typically wraps up during the first week of December. Marche de Noël aux flambeaux: Catch the evening candlelit procession on Mont-Royal followed by a fireworks shows. This event usually occurs the first or second week of December at Parc La Fontaine. Everyone is welcome. The city is aglow with Christmas lights, and there are holiday festivities to attend every day in December. December 25 is a statutory holiday where pretty much everything is closed. December 26 is also a statutory holiday in Montreal and all of Quebec for most everyone except those in the retail industry. Known as Boxing Day in Canada, it is the day when stores offer the biggest sales of the year. Montreal has an extensive underground path network that allows covered access to shops, restaurants, metro stops, and major attractions. This comes in particularly handy during winter's coldest months. Within an hour or two of Montreal, you can find some of the best ski resorts that eastern Canada has to offer, like Mont Tremblant. If you are willing to head out of town, these Montreal day trips are an excellent way to round out your December visit to the Montreal area. Quebec City, the capital of the province, is about three hours from Montreal but is worth the trek. If you plan to stay put in Montreal, then there are a number of outdoor ice skating rinks, including one at the former Olympic Village and the Bonsecours Basin near Old Montreal. To learn more about when might be the best time for your vacation, check out our guide to the best time to visit Montreal. What Is Montreal Like in June?